The soaring price of gas in recent years has made hybrid cars more attractive with each trip to the pump. Their promises of improved fuel economy, lower environmental impact, and good value are hard to resist. But before you drive a hybrid off the lot expecting it to change the world -- or at least soften the blow to your gas budget -- consider new findings from the Union of Concerned Scientists. The organization found that many hybrid models don't save consumers as much money or fuel as they might expect. It's important to understand what a vehicle's hybrid engine will really do for you. Some will deliver strong fuel efficiency. But others apply the new technology toward boosting the engine's power, thereby delivering less improvement in fuel economy and environmental benefit. 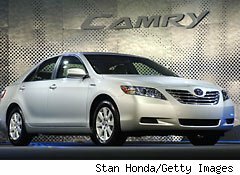 The Nissan Altima Hybrid and Toyota Camry Hybrid, in comparison, both registered 33 mpg on highways. That's close to what I get with my trusty old non-hybrid Volkswagen. That said, getting even 33 miles per gallon overall is a significant improvement over many conventional vehicles these days, though 50 mpg obviously looks more compelling. However, in the future, even the Prius may look like a gas-guzzler. Environmental advocates are urging the government to implement stronger fuel economy standards of at least 60 mpg for cars coming out in 2017 and later. Results also vary widely when measuring vehicle smog and its contributions to global warming. If you buy a Volkswagen Touareg Hybrid thinking you're doing the environment a big favor, think again. It sits at the bottom of the non-luxury vehicle list, scoring a mere 3.0 out of 10 -- and gets just 21 mpg in the process. The Touareg Hybrid emits not even 10% less global warming-related pollution when compared to its conventional counterpart. Again, the Prius tops this list, with a score of 9.2, generating about 40% less smoggy stuff than a regular car in its size and class. It's followed by Honda's Civic Hybrid and Insight, with scores of 7.2 and 6.5. Get Ready to Shell Out for "Features"
Lastly, the Union of Concerned Scientists looked at hybrids' value. After all, who wants to spend more than is reasonable for a set of wheels? Some hybrids' manufacturers pack them with "forced features" that you might otherwise opt to forego, but which you'll end up paying for instead. The non-luxury hybrid vehicles deemed to represent "very good" values include the Prius, the Honda Civic Hybrid, the Ford Fusion Hybrid, and the Honda CR-Z. Six models were rated "poor," and the Chevy Silverado Hybrid 2WD and Volkswagen Touareg Hybrid were rated "very poor." The only vehicles rated as "superior" were luxury vehicles: the Lexus CT 200h, the Lincoln MKZ Hybrid, and the Mercedes-Benz S400 Hybrid. Compelling fuel economy and environmental impact are only part of the car-buying equation, whether or not you're looking at a hybrid. A car's total cost of ownership includes financing, fuel, repairs, maintenance, and insurance. According to Edmunds.com, the 2011 Prius will cost a Washington, D.C. driver $42,219, compared with $35,841 for the Honda Civic Hybrid and $37,094 for a conventional Toyota Matrix. You should also consider the "payback" period -- the time it will take for your fuel savings to make up for the price premium of your hybrid over its conventional counterpart. According to Edmunds.com, for the Prius it's less than a year; for the Nissan Altima Hybrid, more than a decade. Even for a supposedly "green" car, that's a long time to wait to get your greenbacks back.